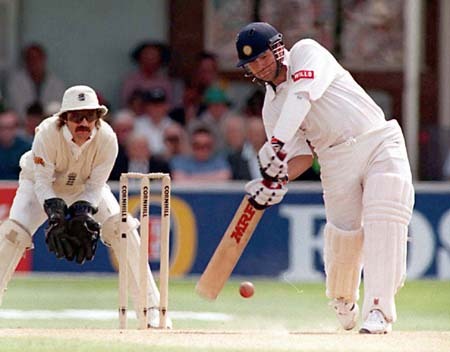 At the rate at which he is blasting bowlers, Sachin Tendulkar will become the highest run-getter in the history of the game in 10 years time, edging out Alan Border. He will also end up scoring at least 1,000 Test runs more than Sunil Gavaskar, and nearly 1,000 runs more than his closest competitor, Brian Charles Lara. An exclusive statistical computation by Outlook shows that 25-year-old Sachin will hit up 11,286 runs if he plays till the age of 38, the age at which Gavaskar retired; or 11,202 runs by the time he plays his 125th Test, the number the original Little Master played to score his 10,122 runs. By 2008, either feat will take Sachin past Border, who scored 11,174 runs in 156 Tests. Like Sachin, Lara is all set to over take his countrys highest run-maker, Vivian Richards. Lara will make 10,184 runs if he plays 121 Tests, as Richards did to score 8,540 runs; or 10,614 runs if he plays till the age of 39, when the original Master Blaster retired. However, neither feat will be enough for Lara to stay ahead of the Indian Little Blaster. The Outlook head-to-head projection shows that Sachin, who already has 16 Test tons to his credit, will notch up 35 single centuries, 15 more than Lara; but he will score fewer double centuries than Lara, Gavaskar or Richards. By our reckoning, Sachin, who has just one first-class double century in 12 years of playing the game, will score only one double ton in his whole Test career. For purposes of these predictions, the trends visible in Gavaskars form with advancing age have been applied to Sachins on a purely hypothetical and homogenous basis. Likewise, the vicious studeis of playing conditions at home and abroad have also been taken into account, computing the averages separately and taking a two-dimensional mean of the figures. This is not - and cannot be - the final word in a supremely unpredictable sport, but the Outlook computation offers a neat (Indian) answer to the oft repeated question Sachin or Lara? and holds the mirror to what Ian Chappell has been saying on air ad nauseam: that Lara has lost his plot a little after 375 and 501. But the moot point is, will Sachins legs hold up for so long? On an average, Sachin plays seven Tests a year (he has so far played 61 for 4,521 runs). To reach the 125-Test mark, he would have to play for 10 more years. Thats a tough task in a sport of diminishing longevity, especially for one who has already been in the business for 10 years. And in an era of one-day cricket. But for Sachin who at 25 has done and earned and achieved everything what only two others (Gavaskar at 50 and Kapil Dev at 40) have in a nation of 972 million, the possibility that heand he alonecan surmount the peak should be the kind of motivation he needs to carry on.